Membership | The International Cricket Hall of Fame. Buy a crest and invest in the game you love! Invest in a Crest and automatically become a member of the Bradman Foundation. Your Crest will be situated in the stunning area of the Bradman Oval precinct, Sir Donald’s final resting place. Of course members can bring their friends and relatives to the Oval at any time to see their name amongst the Australians and Overseas members honoured. Bradman Crests and Badges are gifts that keeps on giving. Why not immortalise that long standing contributor in your club, that outstanding coach/umpire or your cricket tragic cousin? A personalised Bradman Crest including a unique membership number, placed on the picket fence in the Bradman Oval precinct, is the ultimate accolade for any cricket tragic. What person would not appreciate their name being associated with this historic cricket ground, the same place where a young Don Bradman honed his skills? 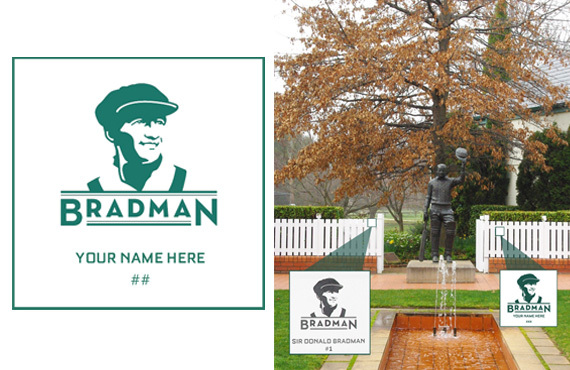 The personalised Crest number can be included on all Bradman Members merchandise. Member benefits include free entry to the museum, earlybird notice and discount entry to all events at the Museum and a regular e-newsletter to keep you up to date on all cricketing and member news. In addition to buying a Crest, you will be helping the Bradman Foundation continue to fulfil Sir Donald Bradman’s vision of educating youth through the values and character building traits of cricket. Bradman Centre on 4862 1247. Download a Crest Membership form here.